Frozen dog and cat food products are being recalled for possible Salmonella contamination. Product label. By: Smallbatch Pets, Inc.
What was recalled: Frozen 2lb. 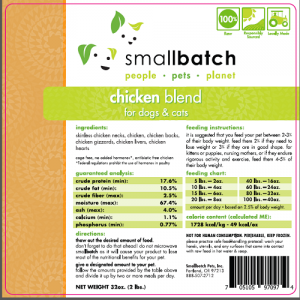 bags chicken blend for dogs and cats, UPC codes 705105970974 and 705105970974 with Best By Dates of 2/1/18 and 2/27/18. The products were distributed to California, Colorado, Oregon and Washington.